For 172 Years Companies have depended on Merrow to provide customized sewing solutions. Merrow Machines are used by forutune 100 companies, design schools, circuses, tailor shops and every type of industrial material processing company. These are just a few interesting ones we gathered along the way. "Merrow knows sewing, from machine to stitch to garment. During our 172 years in the business we've accumulated a vast amount of knowledge on what it means to design, construct, and market a product. We take pride in our work and in our customer relationships and strive to go above and beyond what is expected of us." "We love this machine and the new World it has opened for us. As I have said to Charlie [Merrow] more than once, we love the Merrow Company. You guys have created an engineering masterpiece and you follow that up with a willingness to listen to your customers and encourage feedback. Open communication leads to unparalleled service and a customer loyalty that would rival any brand." "Merrow's partnerships with various OEM manufacturers really helped us on this one - we were able to get the equipment we needed to fit our in-house operation without any disruption to our existing set-up." Find a dealer in your area to help with sales, service, or repairs. Visit the Merrow Video Section for technical demonstrations, product information, and useful tips. Enter the serial number of your Merrow Machine to determine if your Merrow is "old as dirt". Working at Merrow is awesome - join us in Fall River! Your Stitching has value. 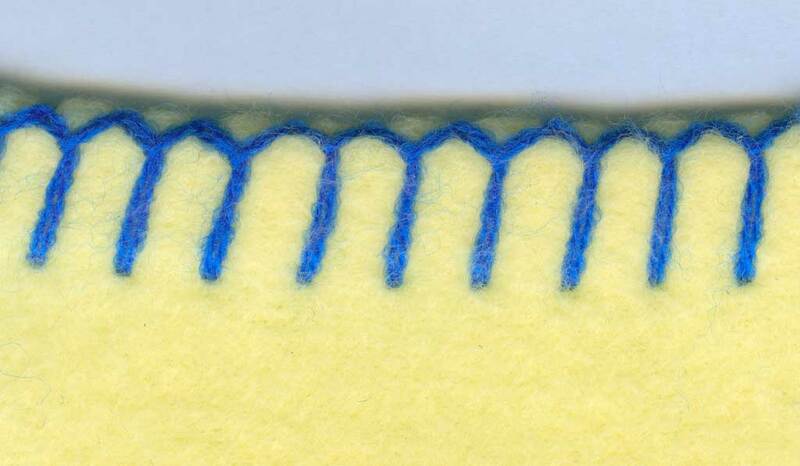 With Merrow's Stitch Lab you have the power to ensure that it won't be compromised while being sewn. Our stitch Lab will sew off your material the way you need it with the stitch you want on your customized Merrow Machine. 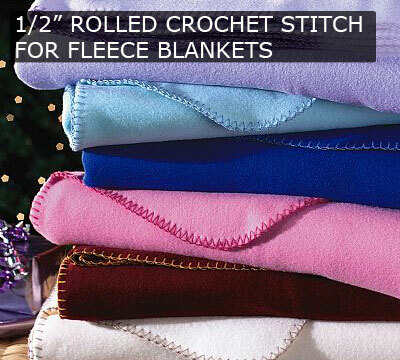 Send us a stitch sample and your material: we'll sew it and have it back to you in 14 days. Enter your email address to coordinate shipment of your material to us for FREE. 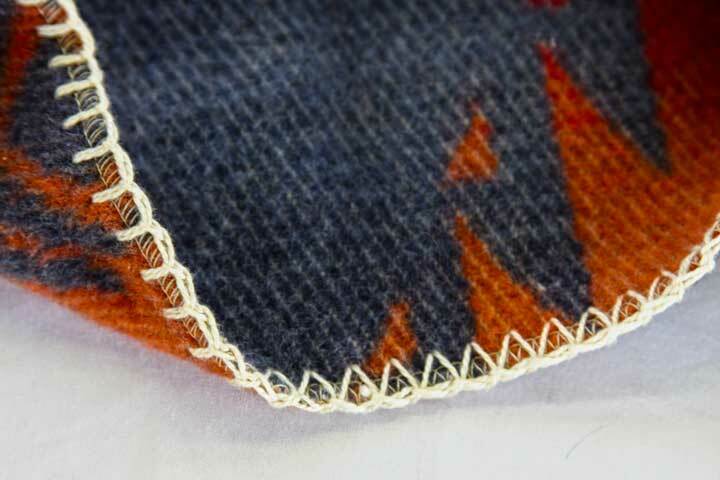 "With Merrow I created a new stitch for my Outdoor Apparel mid-weight line, it's awesome! We were able to develop the stitch and move into production in less than six weeks. The service is unequalled. " 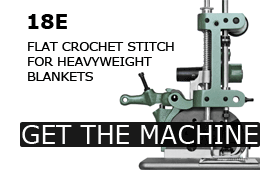 The predecessor of the 18E Crochet Machine was first patented in 1877, and since then Merrow has been refining and perfecting the machine's engineering and performance. 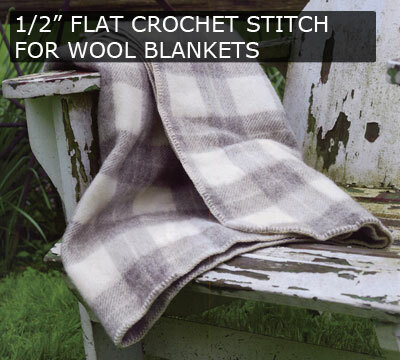 The 18E produces a beautifully flat and uniform finish on heavy materials such as wool and fleece, and the 18E stitch is the standard when it comes to decorative blanket edging. 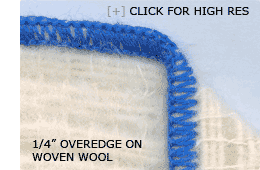 Primarily used for blankets, the Merrow 18E can be used to finish a variety of articles with a decorative crochet edge. It is built on Merrow's cam-driven architecture and uses the latch hook system pioneered by Merrow's founding father, J.B. Merrow. The 18E is a timeless piece of machinery that continues to set the standard into the 21st century. 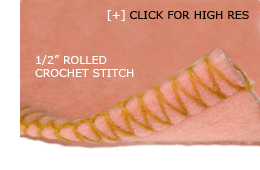 The Merrow Flat Crochet Stitch is a 1/2" single thread stitch that is used to finish blankets or other heavy garments. Merrow was the inventor of the mechanized crochet stitch and has been perfecting its quality and appearance throughout its 120 year history. The Merrow 18A is an adapted version of the 18E, the original mechanized crochet sewing machine. It sews a 1/2" rolled crochet edge using a single thread. 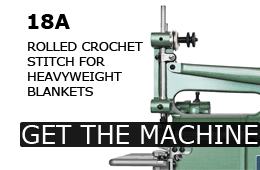 The 18A is equipped with a specially designed guide that rolls material within the stitch formation and works seamlessly with Merrow's cam-driven architecture to apply a consistently beautiful crochet stitch. The rolled crochet stitch of the 18A is a timeless decorative edge that has been the accent of choice on blankets and other garments for decades. It sews at speeds between 1000 and 1400 RPM, making it suitable for production environments, and its durability and serviceability mean it will run consistently with very little downtime. The Merrow Rolled Crochet Stitch is a 1/2" single thread stitch that is used to finish thick fleece blankets and other garments. Merrow was the inventor of the mechanized crochet stitch (the 18E) and has been perfecting its quality and appearance throughout its 120 year history. 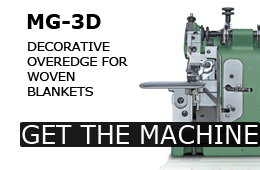 The MG-3D is a version of one of Merrow's MG Class Hemming Machines that has been modified for use on woven blankets. 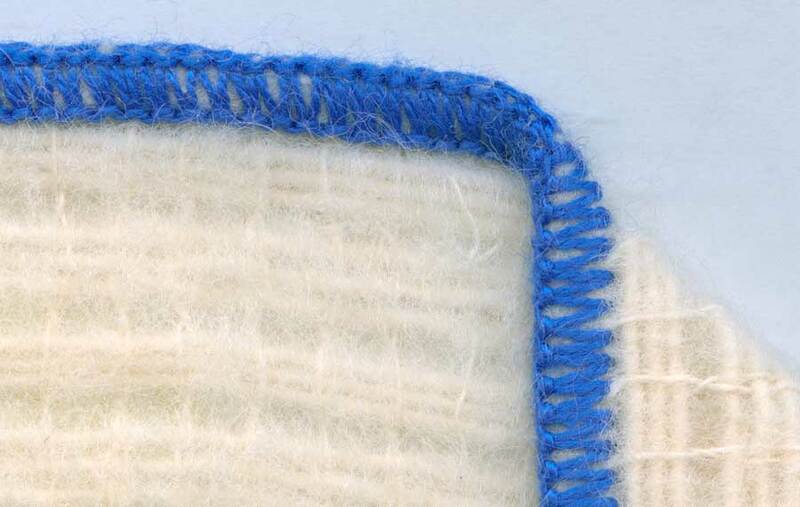 The MG-3D sews a standard 1/4" seam which can be modified according to application requirements, and it sews a unique stitch that is slightly smaller and tighter in appearance from the traditional Merrow Crochet. 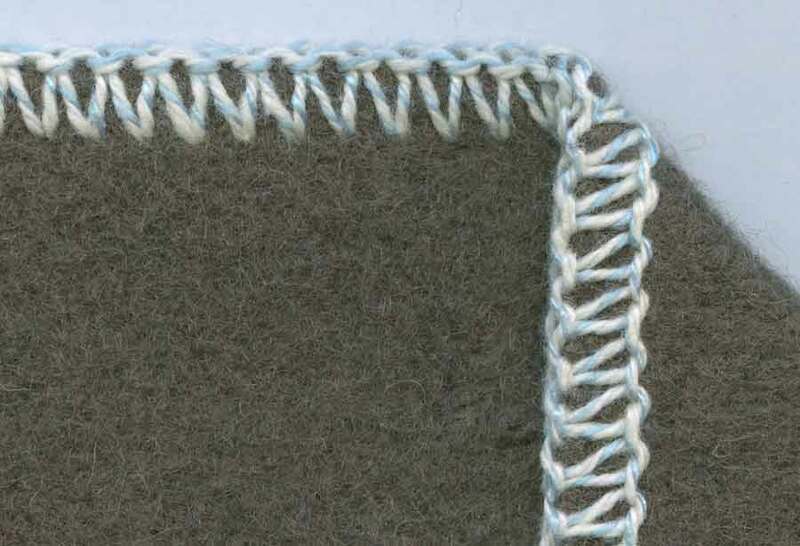 The MG-3D decorative edge is a functional stitch that covers jagged ends and hides loose fibers, and any of its three threads can be varied in color to add further accent. 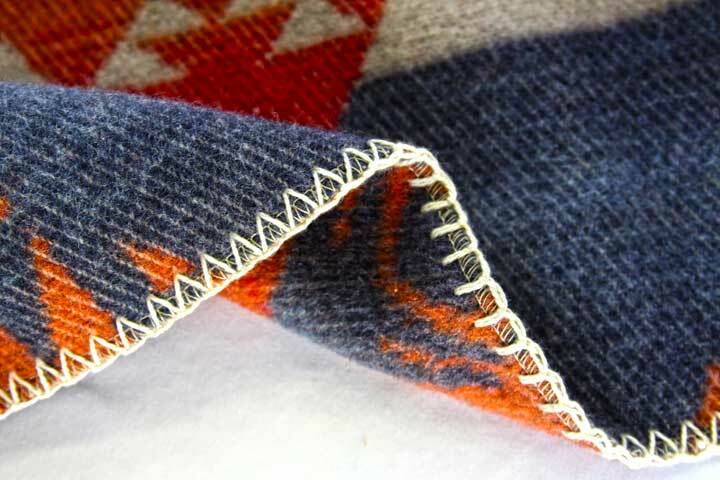 At 1/4" in width, the MG-3D stitch is frequently applied to smaller blankets such as throws and afghans which can be overwhelmed by larger crochet stitches. 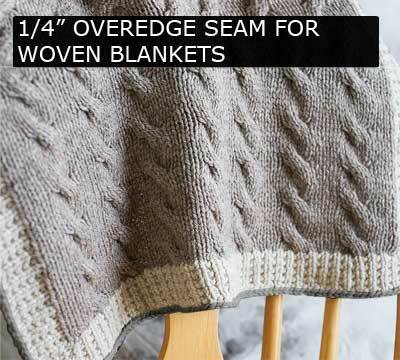 The Merrow Overedge Seam for Woven Blankets is a versatile stitch that adds detail to woven blankets. 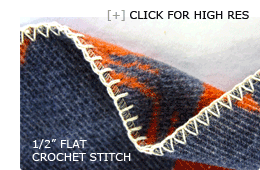 It is a 1/4" wide stitch that is distinctly different from a crochet stitch, yet adds a timeless homespun feel.